Fluoride Action Network | Mackay: So when will a glass of water be fluoride free? Mackay: So when will a glass of water be fluoride free? IF YOU’VE been wondering when your water will be officially fluoride free, ponder no longer. Mackay Regional Council has confirmed it will switch off Mackay region’s water fluoridation systems on Monday, November 7. It follows the council voting 6-5 to remove fluoride from the water supply on September 28. Director of engineering and commercial infrastructure Jason Devitt said the November 7 shut-off date will see dosing equipment at the relevant water treatment sites at Nebo Road, Marian, Sarina and Marwood Bores switched off. However, it could take up to a week for remaining fluoride in the water to be flushed from the Mackay’s region’s water. 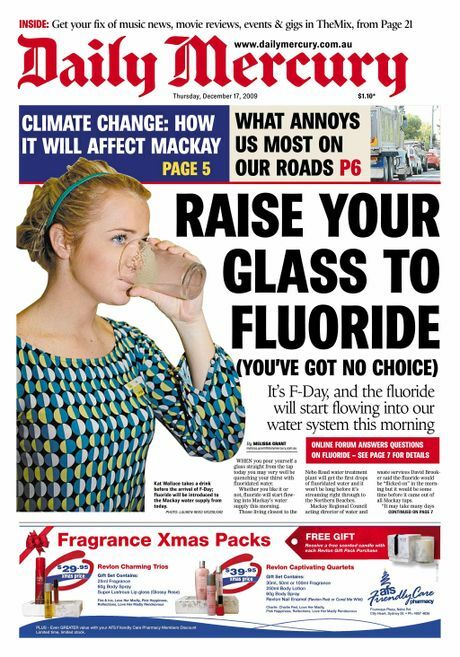 The front page of the Daily Mercury on December 17, 2009, when fluoride was first placed in our region’s water supply. “It will take on average two to three days for the remaining residual fluoride within the majority of the network to clear, however for some of the extremities of the networking it could take five to seven days,” Mr Devitt said. “Once turned off, decommissioning of the fluoride dosing equipment will occur in accordance with the Fluoride Code of Practice and Queensland Health requirements. Mr Devitt was unable to say how the council’s excess stock of sodium fluorosilicate (used to fluoridate), purchased from a specialised chemical supplier called Bisley Group, will be dealt with. “There will be excess stock and council is still considering its options for the disposal of the remaining material,” he said. Costs associated with decommissioning Mackay Regional Council’s four fluoride dosing facilities have been estimated to cost between $30,000 and $50,000 per facility, depending on size, council documents show. “There is a correlation between the cost of decommissioning (removal of fluoride from the water supply) and the time required to achieve this. The lowest cost option for removal of fluoride from the water supply would be achieved in a two-three month timeframe,” the document reads. The cost of operating the dosing facilities is about $60,000 a year for all sites, including chemical cost, labour, maintenance, compliance testing and waste disposal. Chemical costs make up about $20,000 of the annual $60,000 cost. Fluoride was first added to the Mackay water supply in 2009, after the Queensland Government made it mandatory for any town with a population of more than 1000 people. It was then added to the Sarina supply in 2010 and in the Marian/Mirani supply in late 2014, after the construction of a new water treatment plant in Marian. But in 2012, the LNP Government made it optional for councils to fluoridate public water supplies, eventually leading to the council’s divisive decision.